I can’t believe it’s almost Mother’s Day again! 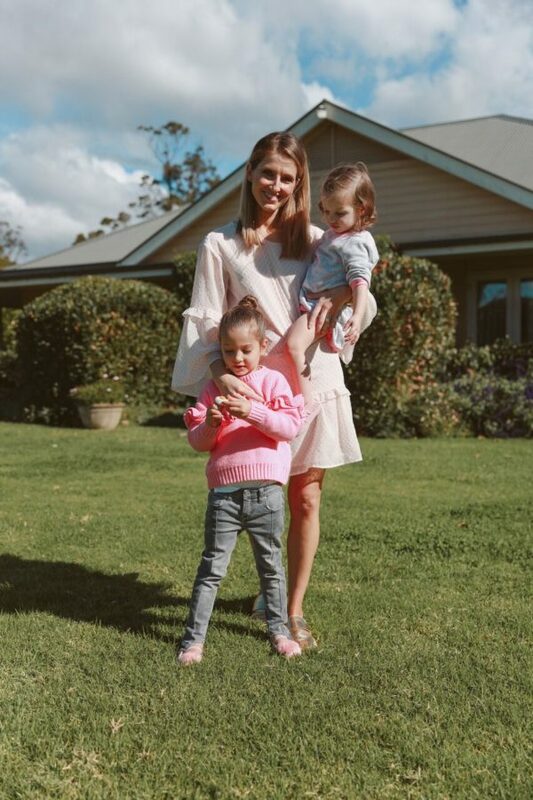 I am so incredibly thankful to be a mum to two beautiful little girls. Sophia and Grace are both growing up way too fast (seriously where has the time gone?) but with each day it’s such a joy to see their little personalities coming through. They’re both so kind, caring and smart, and best of all as sisters, they couldn’t be any closer. I know most parents will probably agree but I can’t imagine what life was like without them. For me, having daughters is a lot of fun. 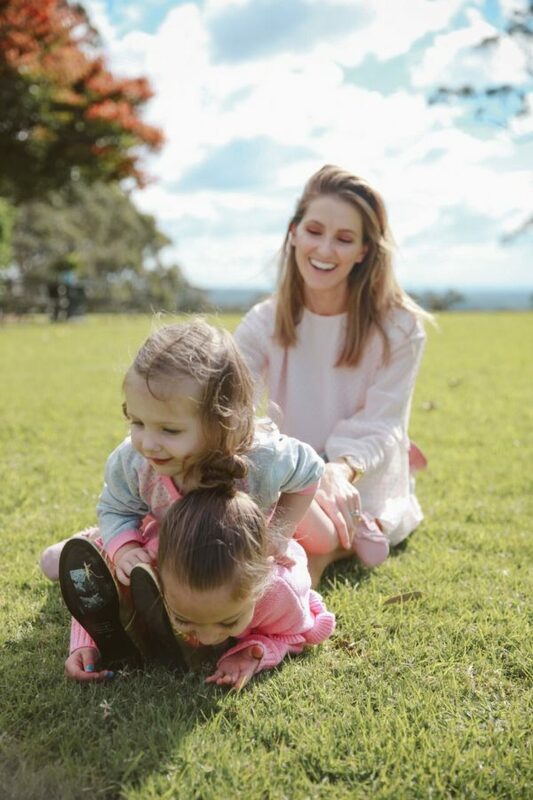 From tea parties to ballet classes to days spent at the park, I always have a ball when I’m with my girls. Being heavily into fashion I won’t deny that I also love being able to dress them up. Even at such a young age they’re already developing such strong opinions about what they like (Sophia would be in her Emma Wiggle costume everyday if she could!) and what they don’t like. It will be nice to see how this changes over the years and I’m sure I’ll lose half my wardrobe to them when they’re a bit older! 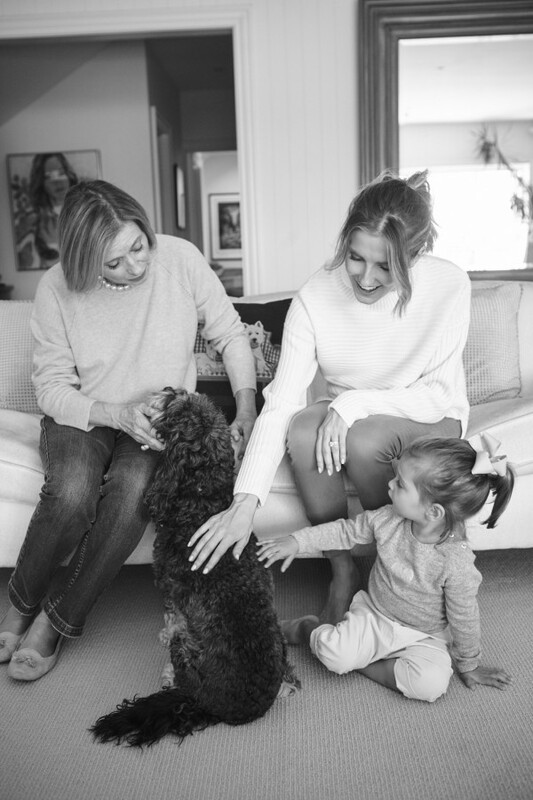 Every Mother’s Day I reflect on what the past year has brought and whilst we have our challenging days, I think every day with the girls is so enriching and in turn has made me a better person. It’s made me appreciate the little things. I can see how excited they are about the world around them, things that I probably would have taken for granted before. It reminds me of the sheer possibility of what lies ahead for them and it brings a smile to my face. It’s a privilege to be able to guide Sophia and Grace through life. To show them what’s right and wrong. To raise them to be strong, confident, capable women who know their worth and won’t settle for anything less. I hope that I can be to them what my own mum is to me. 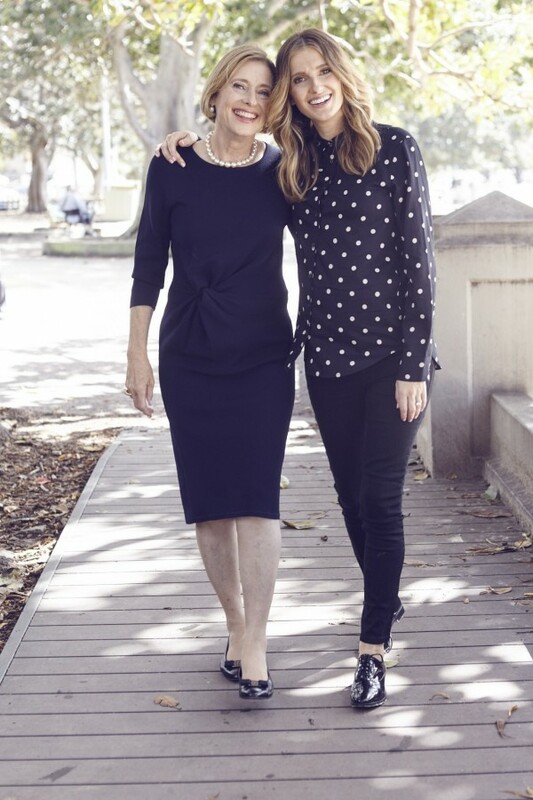 My mum is my role model and a woman I look up to each and every day. If I come even remotely close to that I know I’ve done my job right as a mother. 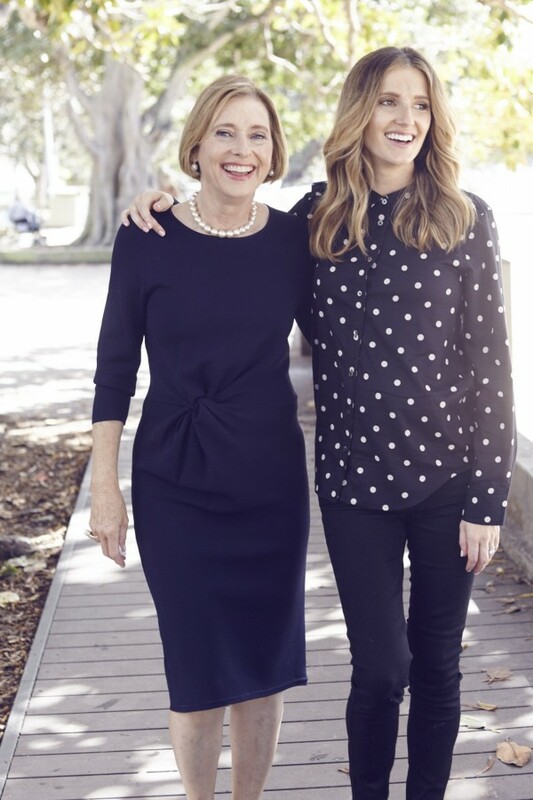 To all the selfless, hardworking mums out there I hope you have a wonderful Mother’s Day! They support us endlessly, are always there to listen and can always be counted upon to give great advice— take a bow mums of the world! My mum is without a doubt my hero and has shaped who I am today so I love spoiling her on Mother’s Day. It’s my little way of saying thanks for everything she does for me and my family every single day of the year. 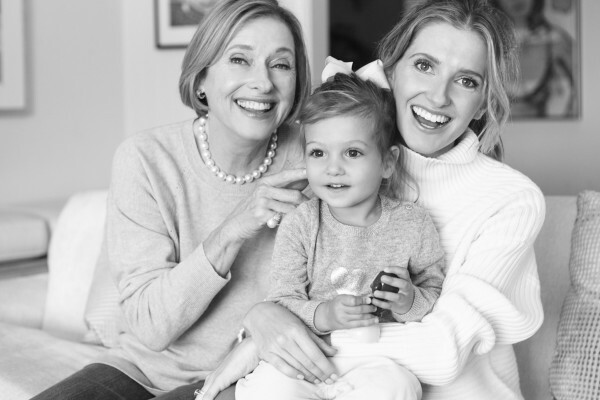 If you’re looking for the ultimate gift to give to your mama, these luxe picks are guaranteed to put a smile on her face. Vibrant red slides, with a too-cute-for-words bow adornment will please any fashion loving mum. Adorable and practical. A winning combination! This beautiful wallet is one that any mum will be excited to carry around. I’m a big fan of gorgeous timepieces. I’m sure this sleek style by Gucci would be well received. Beautiful skin is the gift that keeps on giving. And using this SK-II cream everyday will feel like a mini spa treatment every time. A cookbook filled with delicious recipes that will excite any foodie. 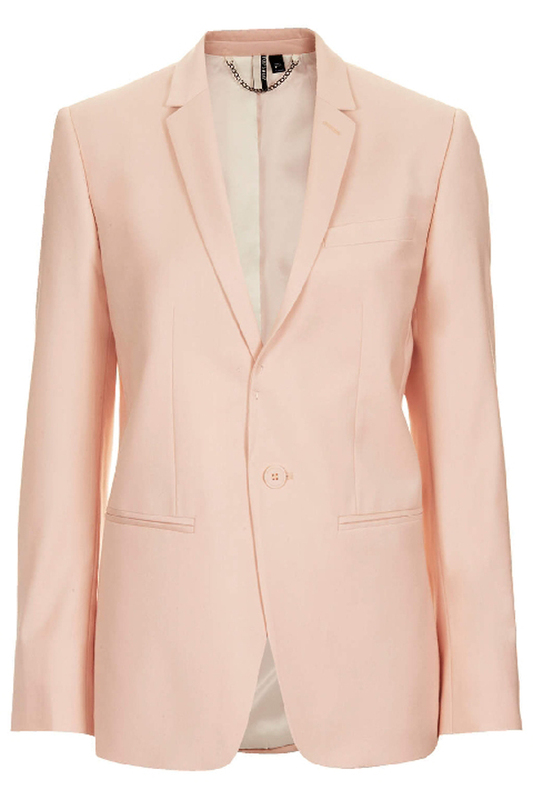 A touch of luxury that’s understated and well, oh-so practical too! This beautiful bold scarf will make for the perfect finishing touch to any outfit. Accessories don’t get much more luxe than this. A statement-making piece for the mum who loves her accoutrements to take centre stage. Simple and stunning, these will get a daily workout. This bracelet will please any minimalist loving mum. Does your mum travel a lot? This set comprises of understated wardrobe basics that can easily be mixed and matched during a getaway. Mother’s Day is just around the corner and there’s no better time to spoil mum and show her how much you appreciate everything she does. 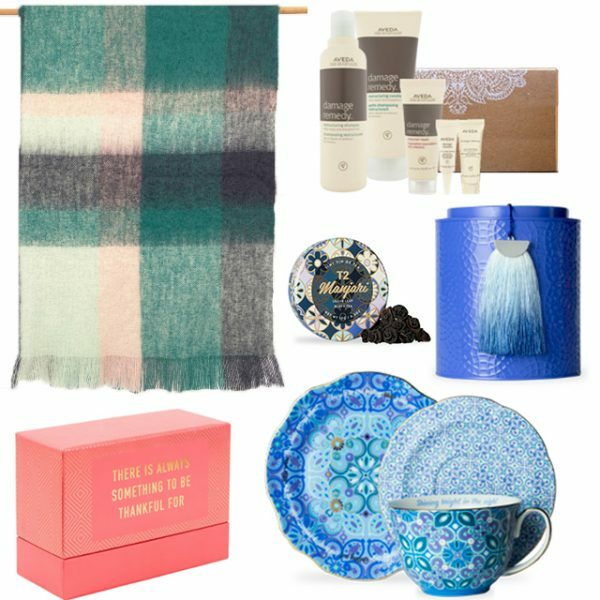 Whether your mum is fashion obsessed, loves to be pampered or enjoys simple creature comforts such is sitting back and relaxing with a warm cup of tea, below I’ve rounded up my favourite gift picks to help put a smile on her face on May 14. All of the products are available to shop at the QVB as well as a range of other beautiful and unique gifts for all types of mums. If your mum is the type who loves to be prepared at all times this beautiful box of gift cards will ensure she’s ready for every occasion thrown her way. Who wouldn’t want to be gifted amazing tresses? This pack will help mum to keep her mane in beautiful shape. Any interiors loving mum will appreciate a cosy throw rug to add to her home. Afternoon tea is made all the more enjoyable with pretty crockery from which to enjoy it from. If your mum is a tea aficionado introducing her to an exotic new brew will definitely earn you major brownie points. This tin is a picture perfect way for mum to store her favourite tea. You can never go wrong with gifting chocolate of any kind, especially when it’s this delicious. Nothing beats a box of tasty sweets and these milk, dark and white chocolate pralines are guaranteed to please. Beautiful sleepwear will ensure that mum enjoys a great night’s rest in style. The spice Madagascar-inspired aroma of this candle will fill any home with a delicious scent. 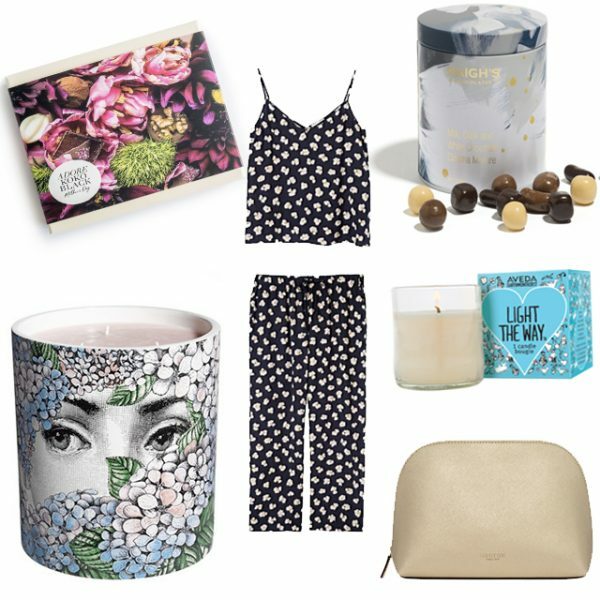 Hand-crafted and housed in a gorgeous ceramic vessel, this Fornasetti Ortensia candle is a truly luxe gift for a truly special mum. This sleek and classic beauty case will house mum’s cosmetics in elegant fashion. A trench is a style staple so any fashion-loving mum will appreciate having this classic piece in her closet. Slip-on metallic loafers is a statement shoe that is both chic and comfortable. Help make mum’s winter look complete with this beautiful felt hat. This on trend bucket bag combines form and function and is the perfect carryall. Compact shoulder bags are very of the moment, especially when in the season’s major hue of a soft dusty pink. Jewellery is always a gift that’s sure to impress but even more so when it’s such a striking design. 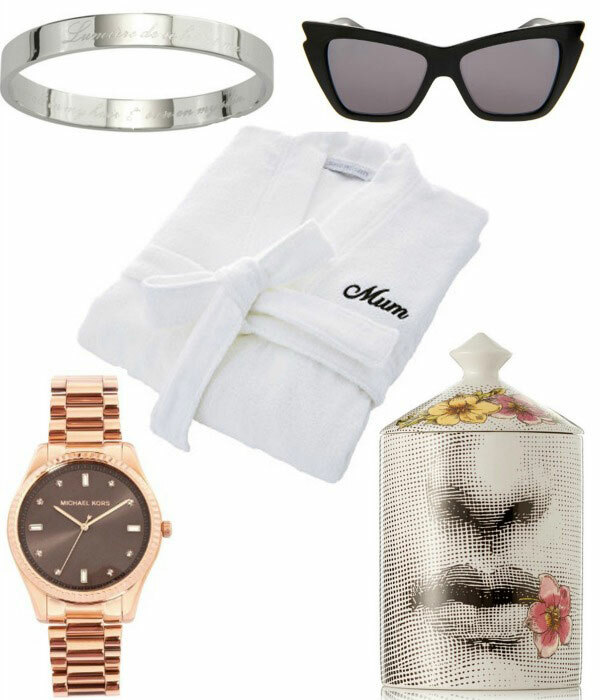 Mother’s Day is the perfect time to spoil Mum. 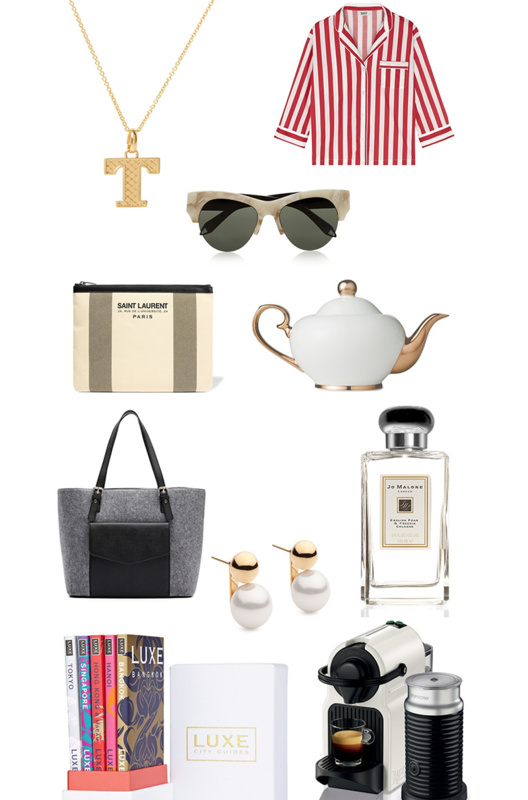 Here are some of my favourite gift options to treat her this year. Simple, elegant and personalised-what more could Mum want? In fact it’s so good you may even want to pick up a necklace for yourself! Sleepy Jones’ ‘Marina’ Pyjama shirt makes catching some shut-eye all the more chic. The classic red and off-white tent stripes and neat French seams add a special touch. For the mum who loves her accessories to make a statement look no further than Victoria Beckham’s ‘Supra Kitten’ sunglasses. The marbled frames give it a modern touch and the cat-eye style is particularly flattering on round face shapes. This pouch is perfect for off-duty days or carrying to the beach. Saint Laurent’s pouch is crafted from hard-wearing cotton-canvas and is also quite roomy so it will easily fit any essentials. A cup of tea is made all the more enjoyable with this gorgeous porcelain teapot which is perfect for celebrating and entertaining in style. It’s even adorned with 24-carat gold which makes it all the more luxe. A lovely — not to mention roomy — tote is always a wardrobe essential. This charcoal tote from Witchery is perfect for winter with its felt finish. If you’re after a gift that will last the test of time you can’t go wrong with a pair of pearl studs which will forever be in style. Jo Malone captures the essence of autumn with the smell of just-ripe pears and white freesias with amber, patchouli and woods. This is my favourite scent and one that I always have in my handbag with me. If your mum is a jetsetter the Luxe City Guide box set comes with easy-to-use travel guides about Hanoi, Hong Kong, Singapore, Bangkok or Tokyo. A must for any ardent traveller. As a mum, I can speak from personal experience that a caffeine fix is an essential on those super-hectic-I’ve-barely-slept-a-wink days. A Nespresso machine is great to have in the kitchen as it’s almost like having your very own barista at home. I remember being heavily pregnant last Mother’s Day and I can’t believe how much time has flown and I’m about to celebrate my first one with my family. It’s hard to believe it’s been a year and Sophia is approaching one. It’s a very special moment and I’m looking forward to spending a relaxed day with Luke and Sophia. I think being a mum is the best job in the world. Sophia comes first in every aspect of my life. 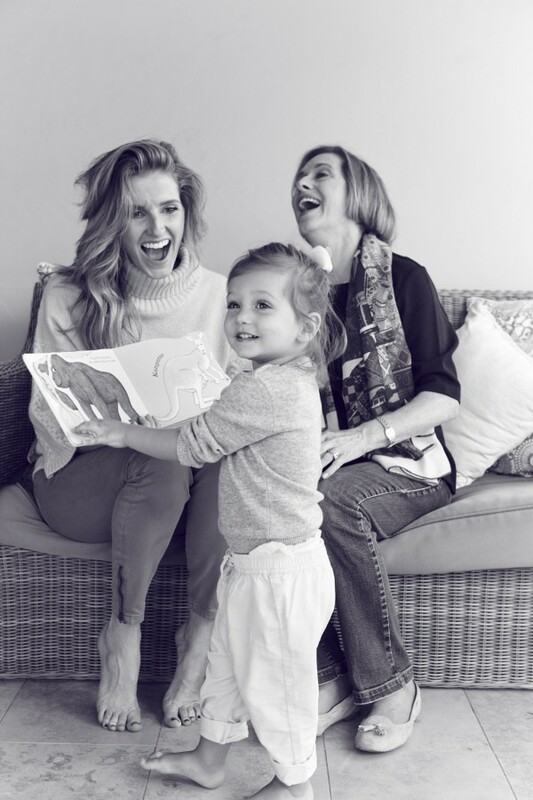 I always knew that it would be an unconditional love like no other but I don’t think you can ever fully understand it until you become a mother – the love I have for Sophia is like no other and she brings so much joy to my life and my husband’s life. I just love the little things – I could spend hours upon hours just watching her and spending time with her. Plus it’s the small private moments like watching her first crawl or watching her try to take her first step, or when she falls asleep in my arms… it’s those moments that just mean so much to me. All I hope is that I’m guiding Sophia in the right direction and being the best mum I can be. It doesn’t matter what she wants to do in her life or who she wants to be, ultimately I just want her to be happy and to smile and be the best she can be. 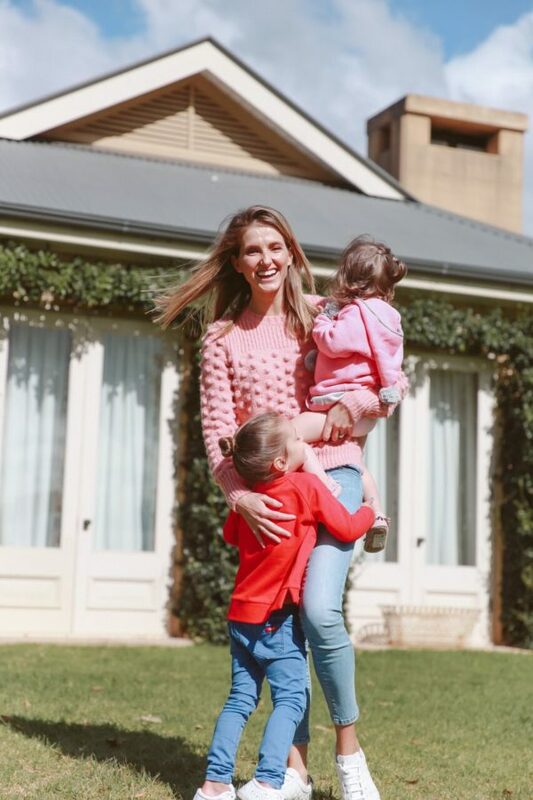 In honour of Mother’s Day, Sportscraft asked Sophia and I to take part in a special Mother’s Day feature and asked me to reflect on life as a mum. Check out the pics and some of my thoughts below. You can read the full Q&A on the Sportscraft blog. My style is relaxed yet polished. My style has definitely changed since becoming a mother. I now opt for more comfortable clothing for everyday wear and I spend a lot more time in flats as I’m always racing around. Also there is never much time for getting ready so I don’t get to experiment with beauty & hair trends as much these days so simple makeup and uncomplicated hair is my go-to. It’s always a bit of a juggle but I feel lucky that my job isn’t 9-5 so I can fit work around Sophia’s schedule. Also I feel blessed that my husband is a huge support, I don’t know what I would do without him. To show strength as a woman, have an opinion and stand up for what you believe in. A classic piece of jewellery for the mum who loves sunny days and hanging at the beach. A luxurious white robe never goes astray. Rose gold is definitely having a moment and this watch is a gorgeous time piece. Black statement sunnies are a wardrobe staple. I think a scented candle is a must for every home and this one doubles as eye-catching decoration for any room. Pearls are a classic addition to any jewellery collection but this is ideal for the more fashion forward mum. I love a great hat! This is perfect for winter and can work back with so many outfits. This printed pouch is a great way to make a statement. I love the fact this scarf has a slightly edgy print. I don’t think you can ever go wrong with anything from Givenchy! A classic plain black pouch is just the right piece for any fashion-conscious mum.